Nordic walking – fitness for hiking? You bet! You are here: Home / Advice and help / Nordic walking – fitness for hiking? You bet! When you were out shopping for walking poles, did you notice some long and lanky, light, one piece poles that wouldn’t look out of place on a cross country skier . Ski field operators in the northern hemisphere agonised over how to attract patrons during the snow-less summer months, until an innovative bright spark dreamed up the idea of a fitness regime for deprived snow skiing enthusiasts using cross country-like walking poles to hurtle around their familiar, but now grassy, ski trails. The idea took off and Nordic walking was born. And there is no doubt that Nordic walking will get you fit. No ifs, no buts – if you take it up seriously your fitness level will go through the roof. The idea of walking with these long, light composite poles is to provide a high energy, low impact workout that strengthens and tightens the arm and leg muscles – read fidibiders here – those wobbly bits that mysteriously appear on the upper-under-arms as you get older! Unfortunately, you can’t use your ordinary sticks for Nordic walking, as the poles are designed to make you use those upper arms. They have special right and left handed grips, and an always-useful wrist strap, pulled in quite firmly the same as your trekking pole, so you don’t lose the pole when you fling it forward as you stride out. If you like to exercise or hang around with others, there are a growing number of dedicated clubs springing up all over the place, all eager to welcome new members- although if you do it really seriously you probably can’t chat. You can even learn how to do Nordic walking properly – a pair of poles and 4 introductory classes costs about $199. For those who do want to do it seriously, $239 gets you the poles, the 4 introductory classes, plus 4 advanced classes. The good news is that, although you have to buy these special poles and maybe pay for a few lessons, the walking itself is free – you can do it around your streets, at the beach, up and down mountains –anywhere you fancy, and at any time you fancy. Seriously though, there are real benefits to be had from walking with these poles. By using your arms as well as your legs, your upper body gets a good workout that strengthens and tones all the major muscles. Increased upper body strength and stamina would certainly come in handy for lugging that 75 litre pack on multi day walks, but the major benefit for bushwalkers is improved stability and balance – think sliding down tree root paths on the OT pushed along by your 75 litre pack, or hauling yourself and pack up those giant ranger-sized steps. 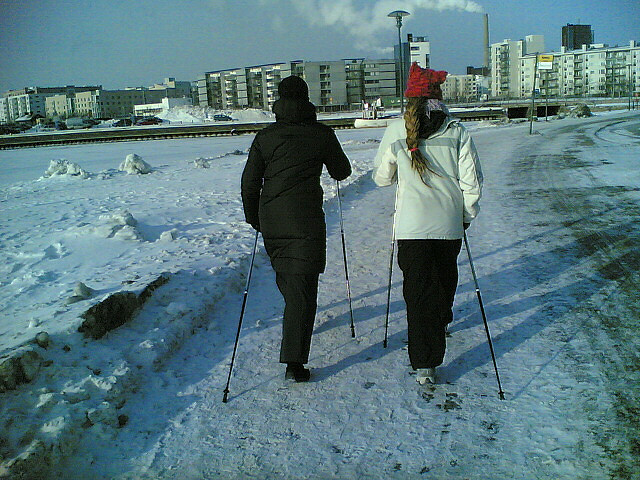 Drop us a line if you are already a Nordic walker – as I am interested to know if it improved your fidibiders. I highly recommend Nordic walking! Here in Finland it is quite popular, not only among athletes but also among the masses.